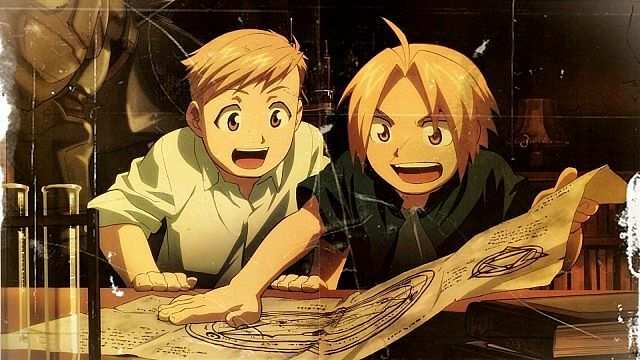 After a mother dies and her two sons attempt to revive her using forbidden Alchemy techniques, brothers Edward and Alphonse Elric must pay the price - one loses his entire body, and the other loses an arm and a leg. Now, the two must go to great lengths and embark on incredible, dangerous adventures to get their full bodies back - even if that means using more Alchemy and making some enemies on the way. Abandoned by their father as kids, two young brothers, Edward and Alphonse Elric lived with their mother in a small town called Resembool. After losing their mother to a terminal illness, they try to resurrect her using alchemy - a science which allows you to transform physical matter from one form to another. However human transmutation is strictly forbidden as it cannot be carried out successfully. The resurrection of their mother failed causing Edward to lose his left leg and Alphonse his entire body. Edward manages to save Alphonse's soul by bonding it to a suit of armor by sacrificing his right arm. Determined to recover their bodies, Edward joins the military as a state alchemist and the brothers begin their search for the philosopher's stone. During their journey they discover the truth about the country's history, and the conspiracy at the higher levels of the military and take it upon themselves to save the country's future. After watching the original I had low expectations for this. I was actually surprised how much better it was. It follows the manga more closely than the original. Is more action packed. Has a better conclusion and better animation. The first 14 episodes is everything that is seen in the original series but doesn't drag on for too long. I enjoyed this very much and rate it as my most favourite TV show and most favourite anime. I recommend this to anyone that is new to viewing anime and to any anime fans that like a lot of action. Fullmetal Alchemist is, in a way, unique. It is very much a mainstream series, with the appeal of a huge cast of unique characters, action that commonly involves special powers, a fairly straight forward story with some mostly obvious symbolism, and a mix of comedy, action, drama, and even some romance. These are all common staples of long running anime series that lean towards a more commercial and public appeal. And yet, for a mainstream series, it manages to continually surprise with a very mature and serious tone. There is a great deal of tragedy and some moments are even frightening and memorable. Few series achieve such a perfect balance of mainstream entertainment and gut wrenching drama and tragedy. Such was what I discovered when I first laid my eyes on the original FMA series. And yet, for all it's greatness, it began to flounder in it's second season. As many series do, it took on its own form and story, and it was at that point that it started to lose its charm. So, Bones did the smart thing. They remade it. For most series, this would be pointless, but for FMA, it's very much welcome. Five years after the original series ended and the manga has had time to grow, this new FMA is better looking, paced better, and follows the manga, expanding the plot in a better direction. It's hard not to like anything about this new FMA. The action is fantastic and looks great, as it always did. We aren't subjected to single shots or poorly edited sequences. All the action is displayed and wonderfully animated. Likewise, all the charm is here as well, from the more serious scenes that fans will remember to the humor which is consistent and still funny. Bones took everything good about the original series and threw out all the bad, replacing those particulars with higher quality details. In a sense, it even feels like a new anime, and by episode 13, it has gone in a completely new direction.